I have been wanting to do a compost for what seems like FOREVER. I just haven't gotten around to it until now. The very first thing I did, before I even had the outside compost up and running, was to start one inside on my kitchen counter. I used an empty coffee container and started putting food scraps in it. I like it because it has a lid and doesn't stink up the kitchen or attract fruit flies. I knew this would be a good project for my son so I put him in charge of making the compost bin for me. First, we pulled out a Rubbermaid tote we had sitting in our garage and he drilled holes in the bottom of it. 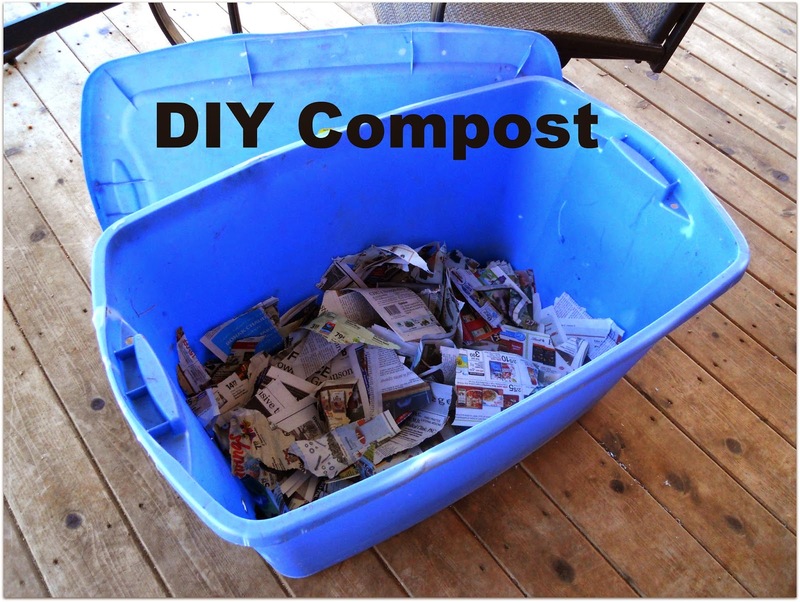 Once the dirt was added, we emptied our coffee container scraps into it and mixed them in with the dirt. We will continue to do this as our container in the house becomes full. We put the lid on it, drilled holes in the top, and stuck it in between the house and garden in a shady spot. That's it! It's so easy. Someday, we will have a better system, but until then I am happy to have taken the first steps in composting. The cost of this project for us was $0 because we already had the tote, dirt, and newspaper. Thank you so much for this! I have been reading articles for days how to figure out how to make one, and this made it so simple!